I know, you're thinking, "but it's Wednesday?!" 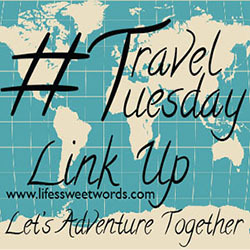 Yes, this month's link up is going live a day late, but... life y'all! I just couldn't get my ish together enough this week to have it up yesterday. Thanks for being patient with me! 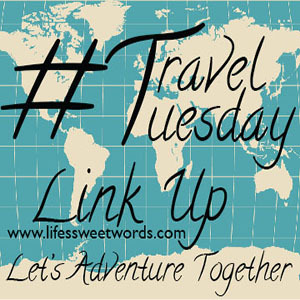 So excited to see where you have been adventuring though, so don't forget to leave your link below so that we can all adventure together! Rainbow Springs State Park is one of our favorite spots when we want a more relaxing weekend! Known for its river tubing, it is a great place to go when you really just want to kick your feet back. It can be really hard to get a spot in the summer, so this is definitely a spot you need to plan ahead for (we booked 6 months in advance), but it is totally worth it as a spot to beat the Florida heat! There is a tram that runs from the campground to the river pull out, but you do have to pay $15 to use that service (also includes a tube). To find out how we tubed for free, as well as more in-depth details of the park and amenities, check out our full post on Rainbow Springs State Park. Highlands Hammock State Park was such a fun spot! Though the campground was very crowded when we went, and we found the spots to be a little too close together, the park is simply stunning. The trees there are thousands of years old and huge, some you can even stand inside of. I felt like I was walking through a scene in Jurassic Park! The trails are all really unique and very neat. 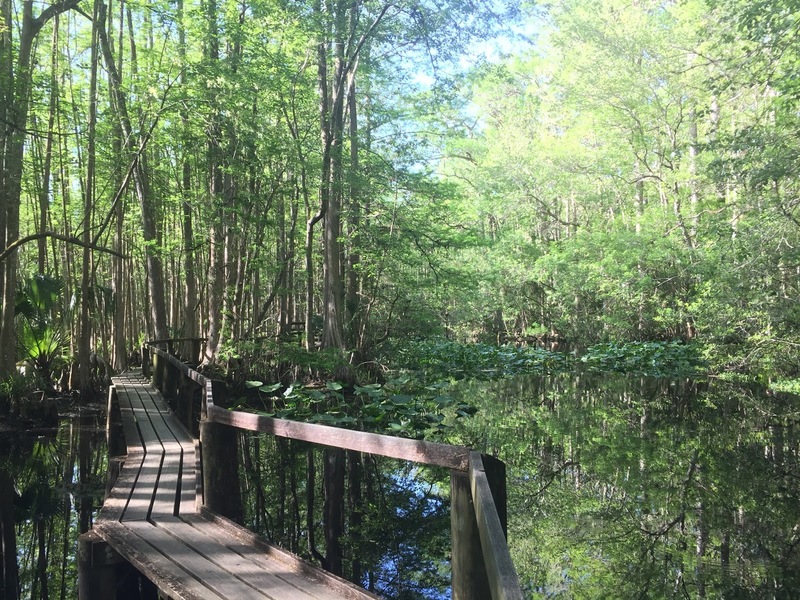 We loved the catwalk trail, with the cut off boardwalk that ran through the swamp. The park also included a tram ride through ranger only park land, a museum all about the creation of the state park system, and a craft morning for kids (select weekends). Fort De Soto was actually the first place we ever took Flo, and we loved it so much, we were back just a year later to enjoy it with friends. The spots are great; most of them right on the water. From your spot it’s a super quick car (or bike) ride to the beach. They also have the old forts to explore, as well as a museum that discusses the history of the forts and the park. Babe and I love exploring old forts and ruins and learning more about the history of Florida (well, he loves reading all the signs and learning all the facts; I love exploring all the nooks and crannies and pretending like I was living in the forts back when they were actively used). There is also a ferry that you can take to Egmont Key, an island accessible only by boat, for a day of more fort exploring fun, a more private beach experience, and the possibility of wading with the stingrays! Manatee Springs State Park, though the furthest on the list, is a great spot to do a little river paddling. Manatee Springs has an outdoor outfitter that you can rent canoes or kayaks from right there in the park. Anderson's Outdoor Adventures will provide you with an rental equipment (or you can bring your own) and they will then take you up river by van so that you are paddling back to the park with the current. It's a ten mile paddle back to Manatee Springs from where they drop you off so it is still a good full morning of paddling, you just don't have to fight the currents! If you leave early enough in the morning you can be back in time to get some super yummy BBQ that they make right there on property. We each got a meal, but they are so big you could definitely split one between 2 people. They also have the MOST AMAZING SWEET TEA that I have ever had (and I like to think that I have had some good ones)!! There is also a swimming/ snorkeling spot in the park, as well as a system of underwater trails for anyone who is scuba certified. Though we prefer to stay at state or county parks, because of cheaper rates and having everything right there (hiking, outdoor activities...) these two Thousand Trails resorts get honorable mentions. Even though the price per night is a bit more they were super clean, had full sewer hoookups and great resort amenities! * Crystal River RV Resort- right on the water with the ability to rent pontoons and in close to proximity to being able to swim with the manatees!! 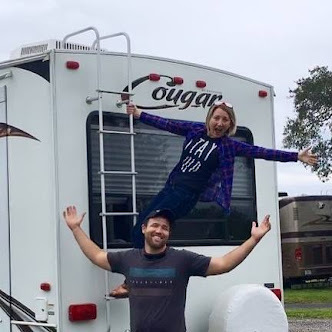 * Clover Leaf RV Resort- We stayed here and then drove over to Weeki Wachee for a day with the mermaids!! These are just some of our favorite, easily accessible spots, from here in Orlando. There are still so many to explore and we can't wait to do just that! What are your favorite spots for a weekend in the woods?! Any good camping near you we need to check out? ~I will also be sharing my favorite post from the month before. April's fave was from Anne of In Residence, because her trip to Malta looked absolutely stunning and has me itching to visit! I am all about a good beach option too!! I never would have considered camping in Florida. But makes for consistently nice weather! Yes, though often way to hot for tent camping, which is partially why we got the RV. Gotta love that AC! There are definitely some good spots, plus if you are not into tent camping a lot of places have cabins available. You captured some great spots! I'm not much of a camper, but I love the beachside getaway one! Yep :) There are a lot of great non-park options to try for sure. Looks like some cool places to camp. I think all of my camping experience is in Canada and a little in the Pacific Northwest of the USA so this would be a different experience for me. The water would definitely be a lot warmer. And I am itching to get out to camp some in Canada!! Give me all the beautiful mountain views!! Yeah, it's usually the first thing people think of, but there is a lot more to explore! We loved browsing through this article. How was the visit to the distillery? Great!! They did an awesome job of both the distilling process, some of the history and then the tasting was so good! They actually made small mixed drinks with what you were sampling so that you didn't just have to sip straight gin, which I very much appreciated! 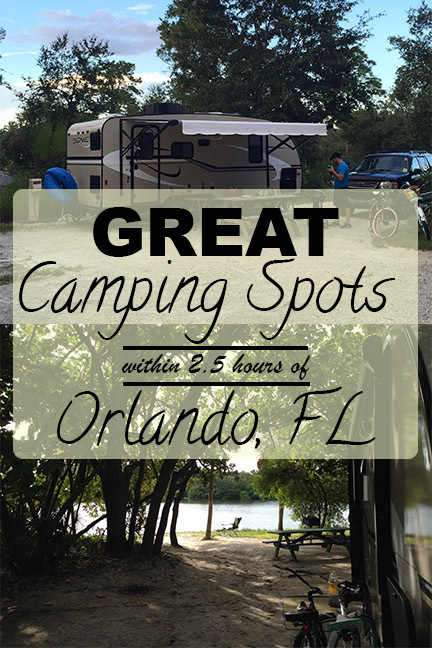 What a great list of places to camp near Orlando! My cousin is coming next month and maybe we will go for camping. Fun! Definitely some great options out there! This place is pitch perfect for camping! Great idea and truly motivational post! We actually didn't on that trip; sadly, it was too late in the season. But we did on our trip to Crystal River. You can actually legally swim with them there, so we REALLY enjoyed that!! I'm not a big fan of camping, but those places all look pretty amazing. The Manatee Springs paddling one sounds like a lot of fun! I am a huge fan of camping. Will keep this list in mind if I ever visit Orlando or Florida. Stunning photos. Yay for other camping fans!! All of these look great especially the one near beach and the Highlands Hammock State Park . I too love camping in the mountains where i can see millions of stars and cool breeze pass through my face. Yes :) I love being away from the city lights with nothing but stars overhead! Even I have a lounger like that. Florida is such a beautiful place. I wish I had gone down to Florida during my stint at NY. The picture with the boardwalk is stunning. Such an inspiring adventure! I love camping from my early childhood! The best thing about camping is that you finally have an opportunity to spend lots of good time with your family and friends. As an additional bonus you are surrounded by beautiful nature, grassland, mountains and the bonfire... It's all sounds so romantic! DC Planning and a FriYAY Giveaway!